After the conversion of the city's Jefferson line to diesel buses on Feb. 7, 1954, followed by the Michigan line on Sept.
also have to cease operations within a matter of months. Alexandria, Egypt and México City, Mexico, expressed any interest, each making purchase offers for the Detroit PCCs. approved a recommendation to liquidate the entire streetcar operation in Detroit during the spring of 1956.
coaches per day beginning in mid-March. yard, forcing the motormen to make unscheduled reliefs on the street in order to maintain some levels of service. last street railway service operating in Detroit. streetcars. A number of the cars were chartered by private clubs, railfans, and even a suburban elementary school. one. But that day which would change the face of Detroit transit for many decades to come had now arrived. General Manager Leo J. Nowicki, the mastermind behind the conversion from PCC cars to GM diesels. streetcars, the city of Detroit replaced Cleveland, Ohio as the largest U.S. city with an all-bus operation. 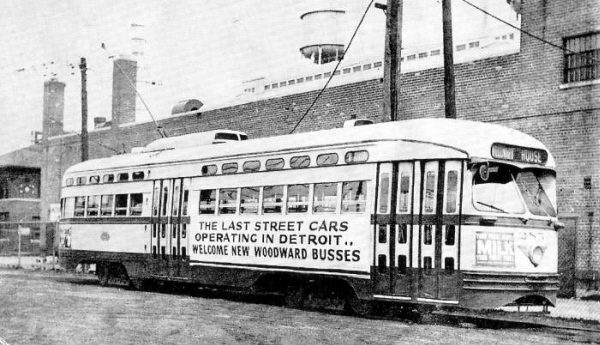 would follow the route of the Woodward streetcar line. "officially" come to an end. streetcars to México City, Mexico. Kansas City Public Service Co. influenced the bidding process by also offering its PCCs for sale to Mexico City. had been declining greatly in recent years, and there was little interest for the cars coming from other U.S. cities. 1945, were rejected, while car #150 had been wrecked in a collision and was later scrapped. car before it left Detroit. concluded that the DSR ended up absorbing approximately $500 per car. experienced a paper loss with this conversion and sale of about $3.4 million. car number). The last of the sold PCC cars left Detroit for México City, Mexico on Thursday, July 19, 1956.
of ERA Headlights — was sent in by Dennis M. Linsky, a transit enthusiast from Brooklyn, N.Y.
last PCC car which was bound for Mexico City. Loaded on a Pennsylvania Railroad flatcar was STE 2185 (ex-DSR 185). undergoing restoration when the carbarn at Tetepilco Yards (the STE's main shop) collapsed, crushing the cars. The earthquake had put an end to nearly 38 years of service from those cars, the first nine of which were in Detroit..
Philadelphia PTC–NCL information was sent in by Michael T. Greene of Philadelphia, PA.